Working At the Carnegie Museum: A Love Affair. The Carnegie Museum and I have a long history. I was born and raised in the North Side of Pittsburgh, and like many a “city kid” I was shuttled by school bus to and from the Carnegie Museum throughout grade school, middle school, and high school. I have vivid memories of sitting at the long wooden tables in the museum cafeteria, under enormous glass windows, scarfing my brown bag lunch so I could get back to exploring. I was the kid who shushed classmates who were interrupting the docents, who asked a thousand questions, read every single word on the exhibit displays, and who didn’t want to leave at the end of the day. When I was an angst-ridden teenager, I would hang out at the museum after school, moping around the hall of architecture or sitting alone in the replica Egyptian tomb. Visiting the museum now, so many years later, I still have the same feelings of comfort and wonder as I did when I was younger. As an archaeologist and general history enthusiast, I love all museums, but the Carnegie definitely holds a special place for me. It feels like my museum. My purpose in writing this post is to share some of my experiences working and volunteering at the Carnegie. I hope that I also highlight the notion that outreach programs and education within public institutions is valuable, worth our efforts, and fun for people of all ages. I went to the University of Pittsburgh for my undergraduate in anthropology. While attending Pitt I had a work-study position through the Carnegie at the “Bone Hunters Quarry,” where I taught visitors (mostly school groups) about extinct animals through the excavation of a fake site. I learned that if you gave a small child a chisel and told them to dig wherever they wanted, you were very likely to ignite a spark within them that excited their curiosity in the past. Although, on occasion a spark was ignited within them to throw the chisel, sometimes narrowly missing your own head, those times were fun too. Either way, this was the first time that I really began to discover how much I enjoyed talking to visitors about archaeology and history. After graduating from Pitt, I found work as an archaeological field technician. Eventually though, I decided that I wanted to take a break from full time field work to prepare to go back to graduate school. Through a series of fortunate events I began, once again, to work for the Carnegie Museum. This time I volunteered at the Edward O’Neil Research Center, which is the Carnegie Museums off-site collections facility. My supervisor and friend, Amy Covell, allowed me the freedom to work on projects that interested me in the lab. When I started volunteering at the annex, the building was in the process of being renovated and many artifacts were going to be moved to new locations. Thus, I began my time there by helping to build permanent supports for fragile materials, including prehistoric pottery, stone tools, and glass artifacts. I learned proper handling of artifacts in accordance with the most current curatorial procedures, and I learned conservation techniques used in cleaning objects, including removing old plastics, adhesives, and ink that were used in the early days of museum storage and curation. My favorite task at the museum however, was to be a part of the educational outreach programs. 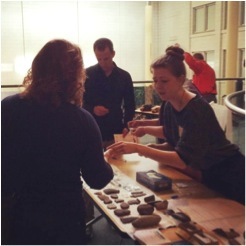 Last June I had the opportunity to speak with visitors about archaeology during the Carnegie’s “After Dark Program,” a monthly series where guests can come to the museum in the evening to explore, eat, drink, and hear lectures on various subjects. Another one of my favorite programs at the museum is “Artifact Identification Day.” This event gives visitors the opportunity to bring in their heirlooms and artifacts to have them identified by staff. 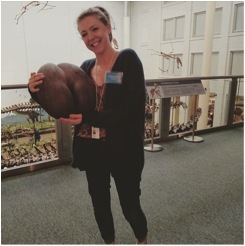 It is always amazing, and sometimes humorous (see photo of me holding a Lodoicea) to help identify the items that people bring. I have often thought of the Carnegie as being a museum of a museum. 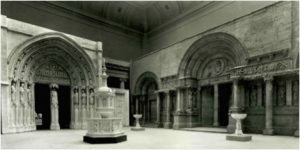 The Carnegie began acquiring artifacts and creating exhibits over a hundred years ago, and many of those early exhibits and artifacts are still on display. Working and volunteering at the museum gave me the opportunity to be a part of the team of people who were helping to conserve and protect these cherished items for future generations. To me, protecting artifacts and archaeological sites begins by showing people why they should care about them. For this reason, programs and institutions that promote stewardship of the past are incredibly important. History is made up of millions of stories. One of those stories is bound to pique the interest of someone! I’m very thankful for my time at the Carnegie, and I look forward to many more years of learning and visiting! This entry was posted in Carnegie Museums, Fieldwork, Grad School, Labwork, Musings, Public Archaeology, Training.